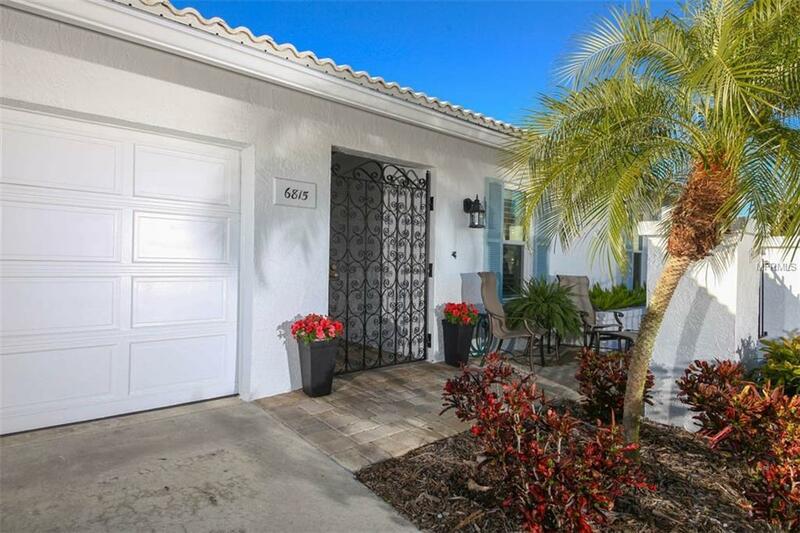 Pristine 2 bedroom, 2 bath villa remodeled and updated from ceilings to floors and everything in between. Textured ceilings throughout, remodeled kitchen with opened wall/breakfast bar from kitchen to dining room - granite counters, Kitchenaid stainless steel appliances, Kraftmaid cabinetry kitchen and baths. Remodeled bathrooms-Gulf Tile. Hurricane rated Weather-Tite windows. Beautiful wood laminate floors throughout except the two bedrooms. Closets by Design. Enclosed Sun Room with air and view of common area and pool; pool is steps away. Paver patios in front near entry and back off family room. Village Green is conveniently located near shopping, restaurants, medical facilities. And for the adventurous, Robinson Preserve is just 10 minutes away; there you can canoe, kayak, take walks, and enjoy some of Florida's wildlife. DeSoto National Memorial Park is also minutes away and situated on the Manatee River. Our golden gem is the beautiful beaches on the island of Anna Maria where you can stroll in the sand and surf, enjoy casual and fine dining and gorgeous sunsets! Some furnishings available for purchase. This is a 55+ community. Pet Restrictions One Declawed indoor Cat Allowed. No Dogs!